Spoilers ahead. I liked World War Z. The producers faced some pretty big challenges, especially in offering something different in an already-crowded genre. Their solution was to create an “outbreak/epidemic” zombie movie, and it generally works. The international focus is refreshing, especially the action sequences set in Jerusalem. The setting, along with the rationale Israel uses to prepare for the epidemic, is really interesting. In survival horror movies, different types of people are forced to work together, and World War Z takes this trope to the extreme by solving the Israeli-Palestinian conflict. Didn’t see that one coming. There are some genuinely tense moments (especially in the WHO facility in Wales), and the Israeli soldier sidekick adds a neat dynamic in the film’s second half. My main issue with this movie is that Gerry (played by Brad Pitt) is characterized as a family man who agrees to a dangerous assignment to protect his loved ones. Fair enough. However, Mireille Enos (who is charismatic and convincing as Gerry’s wife) doesn’t have much to do, and his daughters are props at best. After they board the aircraft carrier, Gerry’s family is never in real danger, and most of Gerry’s problems are zombie-related. 1. After Gerry crashes in Wales, he is rescued by the Israeli soldier he was traveling with; the soldier, Segen, gathers together a small group of survivors, including the co-pilot of the Belarus jet, and they walk together towards the WHO building. 2. Meanwhile, on the aircraft carrier, government officials believe Jerry is dead and send his wife and children to the Nova Scotia safe zone, which is overcrowded. The day Gerry’s family arrives, the soldiers guarding the base barely manage to repel a small boat filled with zombies and are subsequently low on ammo. 3. Gerry wakes up in the WHO facility and talks to the scientists there. He learns about his family and tries to have them moved back to the aircraft carrier. The government refuses and ridicules Gerry’s plan to solve the zombie crisis through Meningitis. Gerry is upset. He talks to his wife, who describes the lackluster conditions in the safe zone. 4. Later that day, Gerry talks to the co-pilot of the Belarus jet, who tells him there is an airfield nearby and a flight to Nova Scotia is possible. Now, Gerry has to make a choice: does he keep serving the government, or does he decide he’s done enough and return to his family in Nova Scotia? 5. Jerry decides that his family, as the commander in one of the trailers declared, is not exempt from the end of the world. He suggests his solution to the WHO scientists, who tell him about the diseases they have stored in the facility’s vault. Except, of course, the vault is infested with zombies. 6. Meanwhile, in Nova Scotia, Gerry’s wife Karin is deals with the food shortage. She has her own daughters to feed, and also the young boy Tommy, whose family helped the Lanes in New Jersey. Karin has an opportunity to steal food but instead bluffs her way into a meeting with the base commander. Once she’s in the control room, she learns that another zombie invasion into their safe zone is imminent. She looks at the map on the wall and suggests different ways to fortify their position using the tides and an existing seawall. (Some explanation for this would have appeared earlier in the movie. Maybe she grew up in a fishing village in England or something. They could talk about this when they’re stuck in the traffic jam early in the movie.) Impressed, the base commander moves her and the children to a more secure area and gives them ice cream. 7. Gerry injects himself with Meningitis and survives. He helps create the vaccine, which helps give the soldiers in Nova Scotia an edge. They are able to defend the safe zone despite having low ammunition and supplies. Gerry arrives and greets his family. 8. 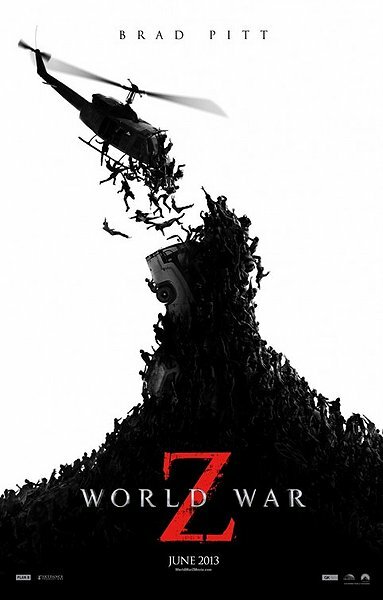 World War Z seemed like the first of a series of movies, each perhaps focusing on a different aspect of the zombie war, in the spirit of the novel. In that case, I would have added a couple scenes at the end suggesting a few different directions the series could take: a nurse fighting an outbreak in Nepal, or a soldier in Kansas who stumbles upon a 1980s-era government bunker filled with zombie test subjects.